Science-fantasy is a criminally underappreciated genre, despite the fact that its responsible for the entire Star Wars saga. Margaret Weis explored it with her Star of the Guardians saga, Simon R. Green offered up what is perhaps its best example in his Deathstalker Saga, and C.T. Phipps & Michael Suttkus gave it new life with their Lucifer's Star series. 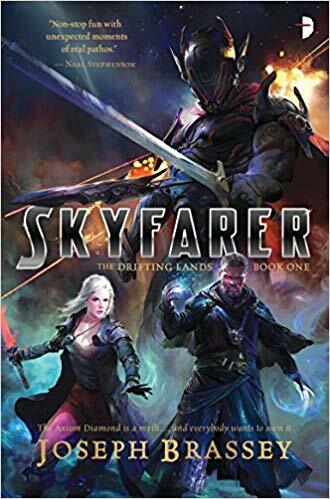 With Skyfarer, Joseph Brassey perfectly recaptures the magic of Star Wars, straying even more into the fantasy side of the genre to deliver one of the most satisfying reads I've enjoyed in quite some time. Since the cover blurb itself calls this "Star Wars-inspired space fantasy," let's start there. 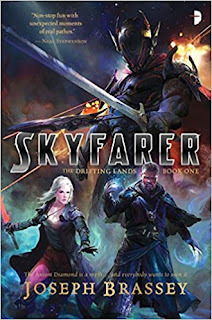 Aimee de Laurent and Harkon Bright are the Luke Skywalker and Obi-Wan Kenobi of the story, while Lord Azrael is Darth Vader . . . except he's more Kylo Ren (but in a very good way). All three are solid characters, with Aimee a strong, confident heroine, and Azrael's overall story arc the best thing about the book. As for the skyship Elysium, it's tempting to call it the story's Millennium Falcon, but it's really more of a magic-fueled Serenity. As for the fantasy side of the genre, this is a book with magic spells, knights, legendary swords, sages, sentient artifacts, and more. The only thing it's missing is dragons and elves, but it does have what could be gods . . . or aliens . . . or some kind of mystical monsters. It sounds like an odd mash-up, a kitchen sink approach to storytelling, but it all fits. As for the story itself, it's a wild adventure, told at a breakneck pace, with nary a moment's pause to breathe. There's even a scene-chewing villain to help propel the story along, leading to a climactic confrontation that resolves the primary plot threads, but still leaves plenty of story for Dragon Road. I was drawn to this book because of the Star Wars comparison too, so if it gets your stamp of approval, I think I might just give it a go. Thanks for the review! I really enjoyed it. Planning to start on Dragon Road as soon as I finish Starless. Awesome review, friend! I'm definitely checking this out.